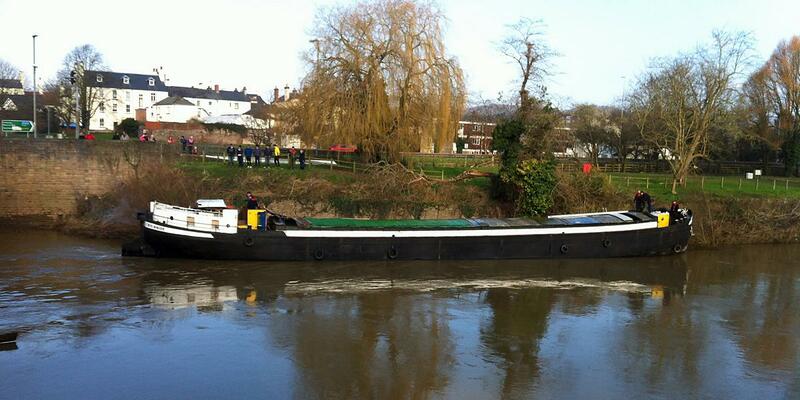 See the Wye Invader Two News page for more info. Click the image below to view the video on YouTube. Wye Invader - The Impossible Journey? Bring a 38 metre (124 foot) Dutch Barge across the Channel, sail it round the South Coast, up the River Severn to Chepstow, then up the River Wye to Hereford, which had not been navigated by any motorised vessel of any size in nearly 150 years - and then 23 years later, return back down the Wye, including passing over the famous Symonds Yat Rapids, to Sharpness for a re-fit - Impossible? - not for The Wye Invader and Frank Barton. Now, in November 2019 the story continues with Wye Invader Two - Details here. First built in Holland in 1930, the Wye Invader was originally named “Luctor”. There is some evidence (although sadly undocumented) she had an extra section fitted and was seconded by the German Army to become part of ‘Operation Sea Lion’, the German plan to invade Britain by sea that was scrapped in 1940. In 1970 she was owned by the Hooiveld family who re-named her “Zwerver” and the family lived on board for several years. 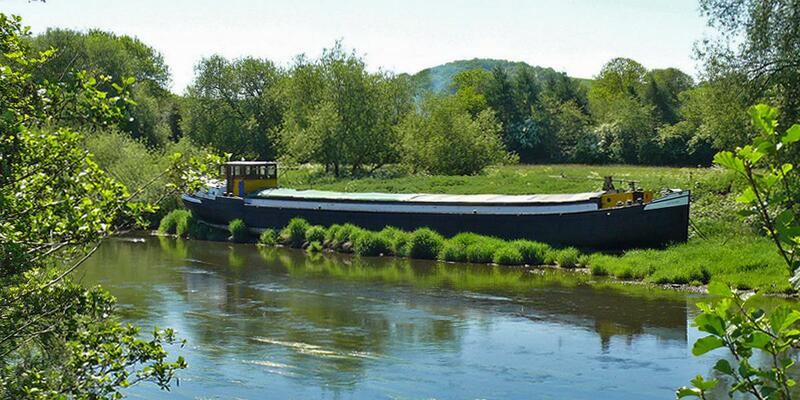 The Barge had several more owners in the years that followed and was finally bought as “Zilvermeeuw” by Frank Barton, a garage owner from Hereford who re-named her “Wye Invader” and who had plans to turn her into a floating restaurant moored in Hereford, UK. Planning Permission was later granted for this. The Barge crossed the Channel, rounded the South Coast and turned into the River Severn Estuary. At Chepstow she joined the River Wye, navigating several tight, well known bridges and then the famous Symonds Yat Rapids. The journey to Hereford of 75 miles was to take longer than planned due to low river levels that summer and she reached her final mooring just above the Old Wye Bridge, Hereford on the 11th November 1989, the actual journey time was 20 hours spread over the 6 month period. The magazine Waterways World published 2 articles about the Wye Invader you can read here. 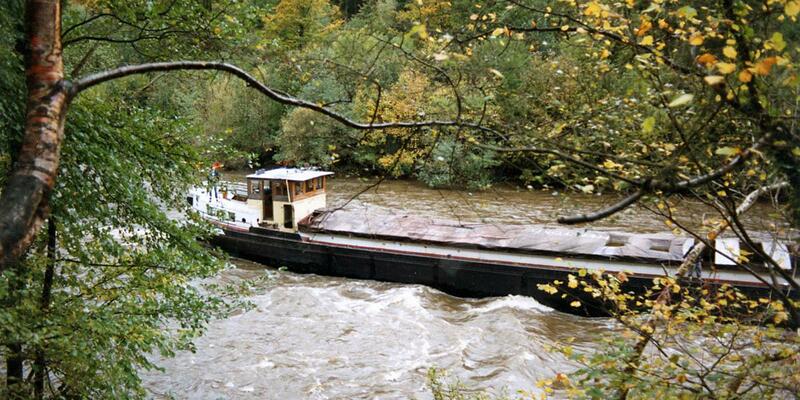 The first known Narrowboat to reach Llandogo since Bernard Jessop with his Narrowboat "Buccaneer" in 1992. Wye Invader Two News and Updates - Click here! 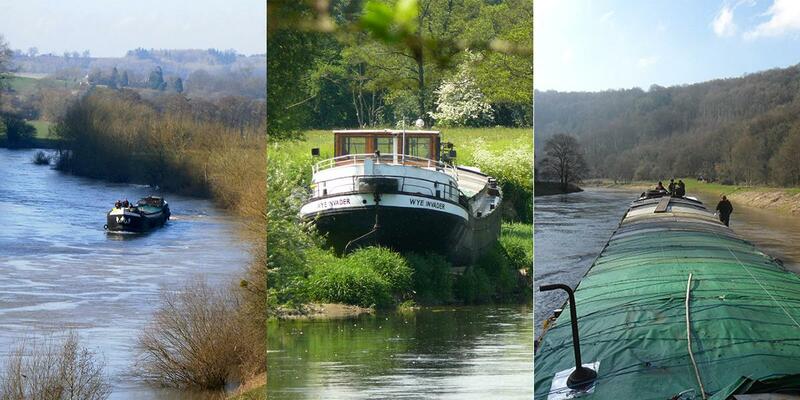 The 2018 trips with Wye Invader Two - Click to see the details here!